While it may be difficult to get any private dedicated proxies for Craigslist easily at affordable rates, you can still post to Craigslist without much hassle by using simple private proxies. It’s natural that dedicated proxies will be costly, and not for everyone. Different users have different budget, and you will have to suit your needs accordingly. Therefore the best way to meet your needs is by finding and practicing other secure ways which would give your ads a nice camouflage and make you undetectable from one location. Craigslist is a great place to find great offers, products and services. You can get practically all sorts of offers on all budgets. No other place is as effective as the multi populated Craigslist listings and even if you bang your head you won’t get such nice resources, listings, ads and variety anywhere else than Craigslist. There are people who swear by the variety of listings on Craigslist, and you are bound to locate a good service there. Similarly as a seller, you can sell practically anything, once your ads find a nice page ina Craigslist page. This is one of the most effective places on net to place an ad, and whichever location you place your ad from, you would definitely get some traffic and view for the ads; such is the popularity of Craigslist. The main problem buyers and sellers face while surfing or posting ads in Craigslist are the restrictions. Normally you are not allowed to post an ad on Craigslist, if you are from some other location and want to post an ad about another location different from your current one. Similarly, you cannot view ads on Craigslist, if you are from another location and are trying to view ads and offers on some other part of the world. To wave off this restriction you need to use proxies to change your system IP. That is the best way to camouflage your IP, and fool the Craigslist server. Then only, you can make your way through their server imposed restrictions, and place an ad or view an ad which is from other locations than your current one. People often debate over the topic that, which type of proxies are best for Craigslist viewing or submissions. Well the truth is,it depends more on your posting style than the proxies.If you are a daily poster then you need to alter and modify your writing style in the ads. That is the best way to keep the patrolling eyes off your posts. Once they find similarities, your ads will get ghosted. No doubt the best proxies for Craigslist is use private dedicated proxies, So their is many proxy service provide the Craigslist proxies, Here’s some good proxies for Craigslist that we’re already test and work great service. 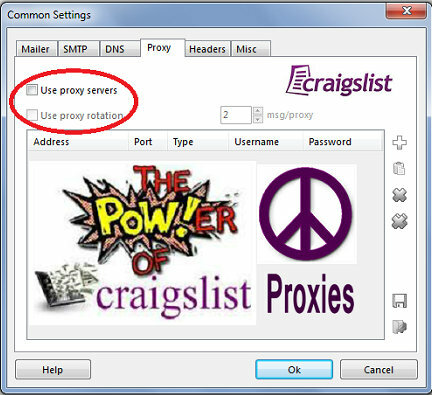 Instead of crying for dedicated proxies, you need to know how to make use of any type of proxy to avail the Craigslist pages. Public, private, dedicated; all types of Craigslist proxies would give you the proper result, when you will know that how often you need to change the proxies, and how differently you need to post every ad on Craigslist.